Tyson Foods describes itself as “an international leader in the food industry, especially chicken, beef, and pork.” More accurately stated, Tyson leads the world in confining, abusing, and killing chickens, cows, and pigs, contributes to air and water pollution and climate change, and causes a wide range of health problems that also increase everyone’s health care costs. Tyson goes to great lengths to conceal the true nature of their business. Their website is a virtual propaganda manual. If you’re looking for ideas for misleading photos and disingenuous policy statements, it’s treasure trove. Here’s a taste. The animals may disagree with Tyson’s assurance that their employees treat animals “responsibly and with respect.” Tyson states they are “the stewards of the animals” they breed in confinement, abuse, and needlessly kill. In fact, they tout that position as one of their core values. 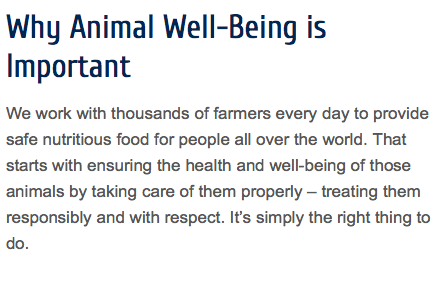 It appears as if Tyson is congratulating themselves on the outstanding work they do with animals. If we didn’t know otherwise, we might confuse them for a farm sanctuary. Tyson also states that everything they do is “to ensure the needs of our animals are met.” If an animal needs to be caged, beaten, transported, scalded, and slaughtered, they’re meeting their needs. Otherwise, it’s torture. Sadly, our culture has become so numb to the suffering of animals that a company like Tyson can market itself as normal and acceptable when in reality it’s a horror show. 1. When you’re on a factory floor and you smell the blood, hear the screams, and see the fear in animals’ eyes, what goes through your mind? 4. When you watch this video, does it bother you that your company is destroying the planet that these animals need to survive? What is the difference between these animals and the animals you kill in your slaughterhouses? 5. Why did Tyson decide to invest in Beyond Meat? Do you plan on additional investments in plant-based meat companies? 6. You stated that the future of animal agriculture is likely meatless. Will Tyson consider creating plant-based products? 7. What do you think of animal advocates who oppose animal agriculture? 8. Why did you choose animal agriculture as a career given that it’s cruel and environmentally unsustainable and negatively impacts people’s health? 9. If you’re comfortable with Tyson’s working conditions and treatment of animals, would you agree to allow live cameras in all of your slaughterhouses so your customers can watch? 10. Do you agree with Ag Gag laws? Why or why not? Good job! I often talk people out of buying Tyson products while at the grocery store! thanks for your focus and dedication to this effort Andrew …. we, the animals, our planet & the world need more people like you !!! Very kind of you Marc. Thank you for your advocacy. Great questions. I doubt we’ll get any answers. Thank you. I’ll keep asking. I’m legitimately interested. Thank you Stephanie. I will continue to send requests to get answers to my questions. I think many people would like to hear the answers. May you and your family and all of your efforts and intelligence be blessed! I cannot see how, in this day & age; people are still so accepting of cruelty. Great piece, that’s a tidy summary of the situation, and the interview questions are direct and appropriate. I won’t expect him to respond to them, but just putting them out there is compelling and worthwhile on it’s own. Very kind of you Melissa. That was my hope at the very least–to remind everyone that what happens at Tyson is not normal or acceptable. I am a subscriber and supporter of your work, and very much appreciate all that you do to help animals. I very much enjoyed your note today, and then started thinking that I haven’t seen you do a $5 Friday in a while, and that if you were to do one, I’d be happy to contribute as in the past. Then I thought about the farm sanctuary where I volunteer every week, and the new resident they just rescued (Pecan the pig), and the new ducks abandoned in Prospect Park as well, and all the new housing they need to build for them all, and I was thinking it would be so great if you were to do a $5 Friday for them. Here is their website and their facebook page just in case you’re interested in checking them out. Has the CEO replied to your request? Thank you for your question. I have submitted several requests for an interview but I have not yet received a reply. I will continue to ask and remain optimistic that at least a Tyson representative will grant me an interview. I provided full disclosure that I am a critic but that I would like to find common ground.